dive into the depths of manners in which such fun could be accomplished. It seems nowadays in the learning world we can?t escape it. Gamification is everywhere and it is here to stay. So, we as professionals need to begin to truly embrace the concept as an evolving practice. In order to do so, it is important that we truly appreciate what gamification, the concept, is all about and why it is so fascinating to the learning world. The main objective of gamification is to turn our everyday learning concepts into something much more approachable, even fun for the user. This is easiest to achieve in processes that are difficult to comprehend or that are a little more obscure than a straightforward and rigid compliance training course. Historically, compliance training is not meant to be fun. In fact, quite the contrary it is meant to be informative, taken at face value, and tested so that there is no question about its intent, or encroaching gray area surrounding what elements can be governed within an organization. But just because that mentality exists, it doesn?t mean that it cannot be gamified or even done in an impactful way that can and will completely benefit your system?s learners. If you are looking to gamify the compliance training experience, there are a few elements you will have to keep in mind. One, it is important not to lose sight of the main message of the training. Two, some things are not meant to be fun, and there are entirely more ways to motivate a user to participate in a gamified experience than just creating a game merely for the sake of having one. Three, tie in scenarios that closely relate to the learners? work life, and fourthly, break down the learning into components allowing for appropriate levels of comprehension and knowledge gain. Don?t just port your compliance training over to a gaming platform. Instead, you will need to consider the ins and outs of what you are hoping to accomplish. Why are you transitioning the content over to the new media in the first place? If you are evaluating your compliance training and you feel that it is just a little too stale or that people are not comprehending all of the aspects currently in your learning mix. It may be time to consider changing your delivery method. In order to migrate learnings over to this new exciting mix, take down a list of what you are trying to present to the users. Be sure not to miss anything, as a game is only as good as its input. Then begin planning ways in which you may deliver those messages directly to your learning base. Making a super fun and immersive world in which players wander around and are exposed to compliance concepts, may not be the best way to approach gamifying compliance. Instead, focus on quick and to the point real-life scenarios and play up the consequences of choices we have to make daily within our jobs. By providing a deep understanding of the practical application, the user can obtain a deeper sense of the concepts as a whole. To further emphasize the need for practical implementation, I have chosen to call out these real-world, real-life scenarios again. 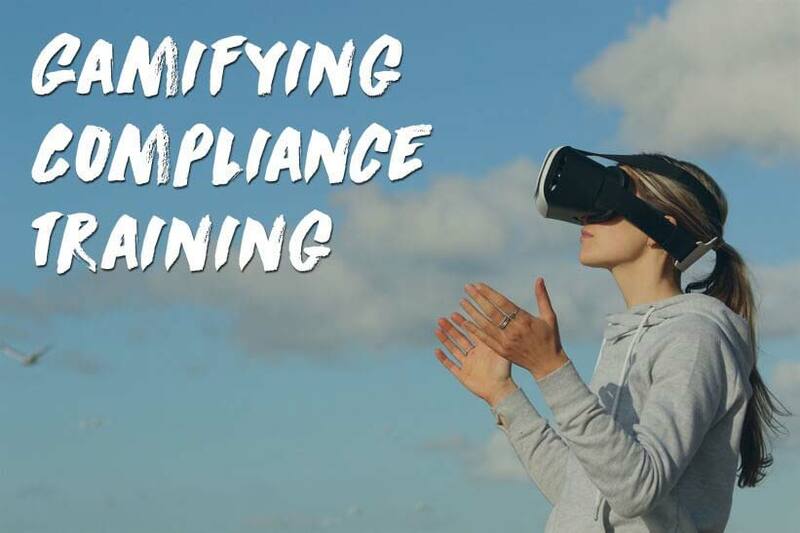 When gamifying compliance training, the most powerful component of the offering is allowing for a platform to simulate and teach standardized practices in a virtual world. In our previous blog post, we further emphasized this concept by establishing the need for archetypes. Users are most likely to identify with characterizations that most closely represent them, as well as situations in which seem real to them. Be careful, don?t just choose members of your workforce and embed them into a game. Instead, assemble characteristics that your workforce exhibits, and use them as the basis for character creation. Unlike normal compliance training, it is imperative not to display all the content at once. Each component must be broken up into its most basic form, for the highest degree of impact. Situations within the games while imitating real-life are not meant to be demonstrated with all the complexities one may encounter at the same time. As understanding is best established at a one to one level. It is important that the content is completely pointed in one particular direction, and that there is no ambiguity in the manner in which it is displayed. Gamifying compliance training is a unique value-added component to a learning mix. Make sure to follow these steps in order to properly implement a gamified platform into your learning and development program. Things like providing real-life scenarios and character based environments are the first step to delivering significant value added learnings into your program. When combined with effective motivation techniques a gamified platform could be just what your organizational compliance training needs to be better received. I hope you have enjoyed your time here with us at the Gyrus Systems Blog. Be sure to fill out the subscription form at the top right of this page (bottom if you are viewing this via a mobile device), in order to have fresh content delivered to you as it is posted, directly to your email inbox.